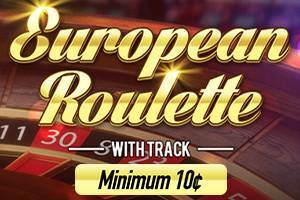 Overview: "Roulette with Track" is a European single-zero game with the additional feature of a race-track betting field. 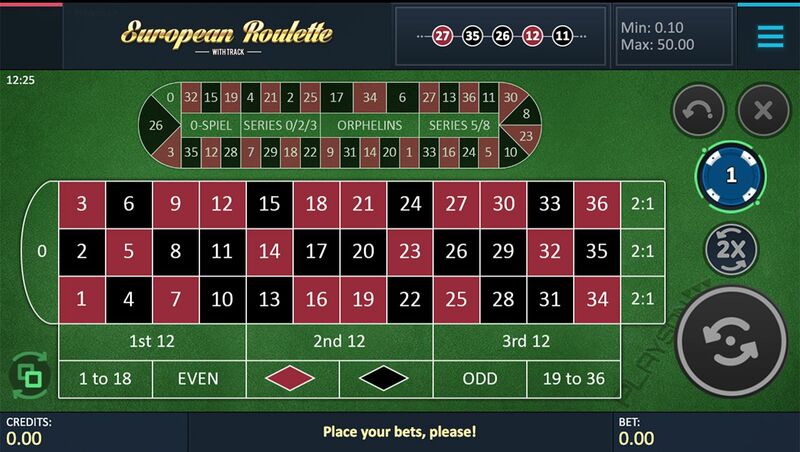 Roulette with Track carries superb aesthetics and superior design along with the standard betting options available in other popular table games. The flow of the Roulette with Track game round combines the best aspects of an online and land-based casino experience. Players place their chips on the roulette table as they would on an actual table while being able to easily move or modify those bets at the click of a button. Players can choose from inside bets, outside bets, racetrack bets, or place combinations of three. Inside and outside bets are made by placing chips directly on the roulette table. When the player points a chip at a bet area, the numbers included in the bet are highlighted and a small information window displays the minimum and maximum bet restrictions. Once the bet is placed, the contents of the window change to show the value of chips currently placed on that bet and the payout in case of a win. Racetrack bets, on the other hand, are made by first opening the racetrack and then placing chips on the selected bet areas. When a player points at a bet in the racetrack, the corresponding numbers included in the bet are highlighted on the table.